13 artists from 8 countries discover the road as a ritual in Gorna Lipnitsa. Home > Edition 2017 > 13 artists from 8 countries discover the road as a ritual in Gorna Lipnitsa. The road as a concept and an idea is different for each individual person. For some, it is just a connection between point A and point B, for others – the development and meaning of life. For the village of Gorna Lipnitsa it is a ritual. It will be this at least during the 8th consecutive “The Old School” Art Residency, which has established itself over the years as a significant world-wide center of contemporary art. where does the road start, can we get lost, the role of the crossroad and the choice of the direction, the speed and the time we need to get to the main question – What is the purpose of our journey. All this is transformed through the idea of the ritual art, the lawyer and artist Dimitar Palov, who is one of the organizers of “The Old School” Art Residency, told the Tsarevets Vesti newspaper. 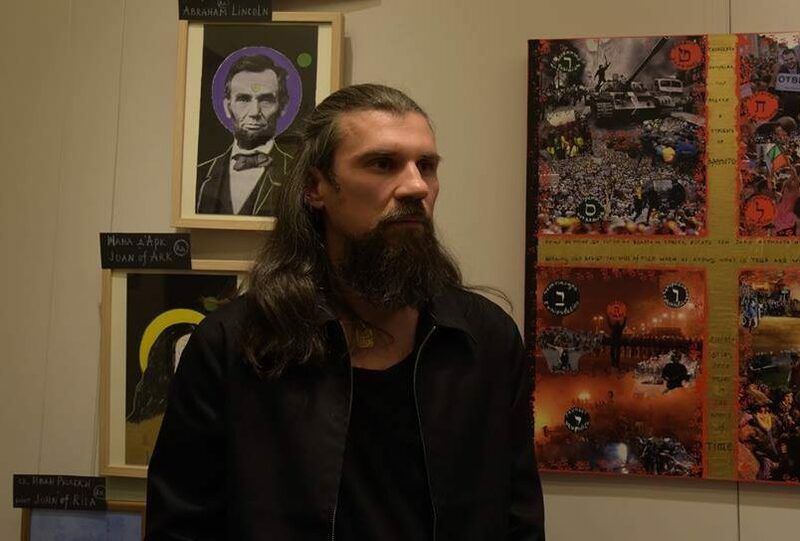 Besides the main acting role he participates in the creative forum, Dimitar, together with Darina Palova, is the founder of the artistic movement “Ritual Art”. It provides a contemporary insight into ancient knowledge and ritual practices, following a socially meaningful goal /more about the essence thereof you can see here/. The art event also has a rich accompanying program including children’s school, lectures, concerts, an exhibition for which we will be informing you about in the coming weeks. We talk with Dimitar Palov more in regard to the road, the conscious pursuit of perfection, the realization of a large-scale artistic forum in a typical Bulgarian village and for the inclusion of the local children in it. What is the road as a ritual? It has always been interesting for me to observe, as an Experimenter, who has participated in the forming of the experiment, how the idea of the ritual art is being developed at the moment. Interestingly, it has evolved, on the one hand, as an artistic flow and a way of making art in general, on the other hand – as a conception, a philosophical concept of a way of living, of a way of behavior. The lines of this idea we have spread from Bulgaria to many different parts of the world through the communication we have every year with many artists from different destinations. This way of making art and living also refers to man as an individual and his participation in any social organization – family, political parties, non-profit organizations, business associations, as members of local communities, cities, countries. The whole idea is aimed at creation and change, i.e. Man should also strive to change things, and do so to achieve better level. Assuming that the perfection which can be achieved by doing something is a chimera, then the more important thing is the road to this perfection and the steps we take towards it. Similarly, a work of art should be aimed toward change and improvement in order to achieve perfection. What happens when we follow this road? We follow political, economic models of making art and accordingly – we use creative techniques and models for making economics and politics. In this connection, probably the ritual art may be the way and the form of creating new policies, as well as both national and global, which are steps and moves towards perfection through the form of creativity. This is the notion of the road as a ritual in its philosophical conception. How did you select the participants in ”The Old School” Art Residency 2017? We were looking for such projects that are somehow related to the specific location. Each of the artists takes a conscious journey, starting from the place where he is at the present, and reaches Gorna Lipnitsa, Bulgaria. They have not come here accidentally or just to kill time – they know where they are going and they want to follow this road. Their creative pursuits include the local community, they are experimenting, exploring the local lifestyle, culture, customs, architecture, artifacts from ancient times. What roads will the artists follow at this place to find inspiration? We have always sought to visualize the ideas we have. So this year we have provided different variations of roads that can be followed walking or running. Part of the concomitant program includes a 10-kilometer run with the goal of a panoramic mound in the vicinity of Gorna Lipnitsa. We have offered different routes. For example, remnants of Roman roads (given the proximity of the Roman city of Nicopolis ad Istrum – editor’s note). The American participants show a great interest in these, especially the artist Jason Kofke, who insists on working with a local archaeologist, to learn more about the Thracian and Roman settlements that existed in the region. The Republican road going through Gorna Lipnitsa will be available, which after long protests is now completely new. We have also demonstrated the air route over the village that links Turkey with Western Europe. The artists can watch the aircrafts at a certain time interval and will know which one, when and in what direction flies. There is an artistic route passing through the village that is part of a 3000-kilometer performance of the Indian artist Nikhil Chopra. From here also passes a pilgrimage route “In the footsteps of St. Ivan Rilski”, which starts from Veliko Tarnovo and reaches the Rila Monastery. To complete their works, artists will have the opportunity to experiment with different types of roads in order to feel what they want to do. Our participant from Germany has an idea for a very interesting project. She is also a journalist for the Frankfurter Allgemeine Zeitung Newspaper. This will take place with the active involvement of the local community, which will be reflected in the articles in the newspaper. What is the participation of the children in the Art Residence? This is a long topic for conversation because I and the colleagues have always considered that as creators of ideas, our important task is to work with children. This means to teach, train in some way the young or those who come after us. Interestingly, a generation of children actually grew up in the Residence. And these children have a different view of the world, a mindset, which makes me very happy. Every year, they meet with people from all over the world, who are representatives of different cultures, different behaviors, view of the world, and above all, artists – people who are creating something. At the same time, children have a special attitude towards the school in Gorna Lipnitsa (the old school), to the places where the Residence is taking place. Equally with all of us, they participate in the whole process of preparing the event. Starting with cleaning, everyone does everything. Before the Residence began, the local school, which was very large, with many rooms, was continuously subject to vandalism. Now none of these young people will come to break anything, and on the contrary, they will try and keep it this way. If we want to have a Bulgaria with a big B, we have to have education. There is no way to make a change and to hope that this will be effective only with regulations or sanctions. People must have an inner conviction that they have to do this and to keep it safe because it is important to them. What was the road for the Art Residence? For us Gorna Lipnitsa is an interesting experiment – cultural, social, educational. For eight years, we have transformed the Residence from nothing into something big, large scale, both as an organization and as an idea. Perhaps people become aware of different elements of the event, but it is interesting as a whole. For this time, we were able to prove that everything is possible to happen everywhere. It is sufficient to have the physical, mental, and creative endurance to achieve it, go the road towards it. From a completely unknown village for the artistic communities Gorna Lipnitsa has become a symbol of creating contemporary art for artists around the world. Annually we have a large number of inquiries and interest for participating in the Residence. This makes me think that if this model of doing everything is possible in Gorna Lipnitsa, then this can happen also in the Municipality and in the Region, in Bulgaria at the national level, and all over the world, too. It is a question of selection of people who have potential. Organizers: “The Old School” Art Residency, “Zora – 1887″, Town Hall of Gorna Lipnitsa, “Gorna Lipnitsa Development Association”, with the financial support of the Pavlikeni Municipality.